On no account should you miss these 14 things in Zurich. 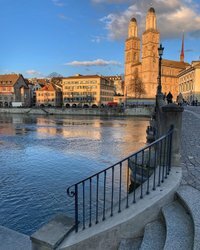 Water, water everywhere: a dip in Lake Zurich or the River Limmat belongs just as much to Zurich as a ride in a pedal boat or a mild evening in one of the lakeside Badi-Bars. The towers of the Grossmünster Church characterize Zurich’s skyline. Incidentally, you can climb to the top of the Karlsturm, where you are rewarded with a spectacular panorama. No visit to Zurich is complete without sampling the traditional local specialty, Zürich Geschnetzeltes with rösti potatoes. It tastes best in one of the guild houses or in the Kronenhalle. 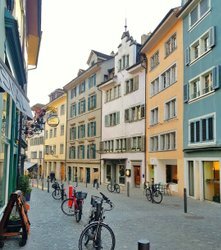 Zurich’s picturesque Old Town tells the city’s 3,500-year-old history on the Lindenhof, at Schipfe and in the Niederdörfli quarter. 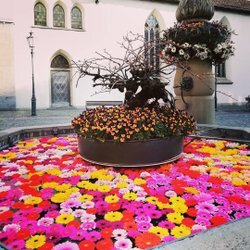 Zurich is home to over 1,200 fountains. The water flowing out of the pipes is of drinking quality and can be consumed without problem. The historical Polybahn funicular takes you from Central up to the Polyterrasse in 100 seconds. From here, you can enjoy superb views of the city. The world’s most luxurious shopping mile is located in Zurich. The exclusive Bahnhofstrasse is lined with countless boutiques, department stores and design stores. The Uetliberg can easily be reached from Zurich with the Uetliberg railway in just 20 minutes. If you are feeling energetic, you can walk up to the top in around 1½ hours. Light and airy Luxemburgerli macaroons from Sprüngli or exquisite Swiss chocolate from Lindt, Läderach or Vollenweider: you just HAVE to sample these mouthwatering treats. Zurich Zoo is one of the best and most attractive animal parks in Europe. It plays a leading role particularly in the areas of education and the protection of nature and species. The spectacular FIFA World Football Museum in Zurich enthralls soccer fans of all ages. Attracting one million fans every year, the Street Parade is the largest techno- and electro party in the world. Zurich has the highest density of clubs and bars in Switzerland. Its Western district is particularly popular among partygoers. Whether the National Museum, Kunsthaus Zürich, Cabaret Voltaire or Zurich Opera House: the City on the Limmat offers first-class cultural events.